The Art Nouveau period saw artists find inspiration in nature. It involved replicating organic elements with beautifully curved fine metals. The late 19th to early 20th century saw Art Nouveau extend beyond a mere style. It formed a mindset that followed the idea that “art should be a way of life”. Many Art Nouveau pieces were soft and delicate. Holding romantic features to emphasise colours within the gemstones. Pearls were commonly used, as were pastel shades, along with enamelling for further effect. It was during this Art Nouveau period that the Victorian and Edwardian Era’s overlapped. Both were as unique as one another, with both influenced by the Monarch of the time. This month, Gerard McCabe choose to share a new addition to our Antique & Period Collection with readers. 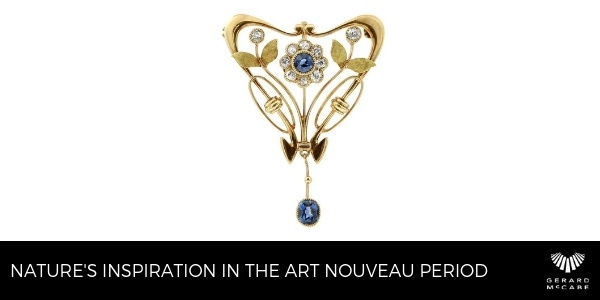 The Art Nouveau Sapphire & Diamond Pendant/Brooch, is a wonderful representation of 20th century craftsmanship. The design consists of a unique feature, next to the beautiful bright blue sapphires. Featuring wonderful curves, is the central cluster that alludes to great Edwardian influence. This central cluster is a unique attribute, very Edwardian, yet the curves and floral inclusions speak volumes to Art Nouveau influence. The scrolled and floral design, with the central sapphire cluster and drop pendant, are delicate additions to this beautiful pendant. It’s a very interesting design. 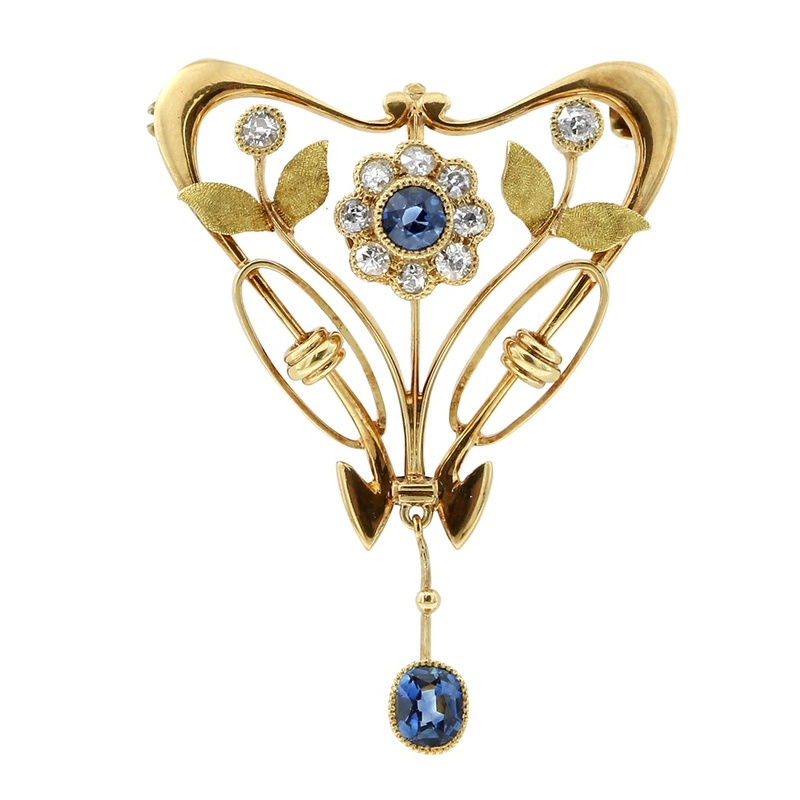 Gerard McCabe’s Antique and Period Collection has long included brooches from the Art Nouveau period, but very little with this Edwardian inclusion. We invite you to visit out Adelaide Arcade boutique and discover the additions to Gerard McCabe’s Antique and Period Collection. Our collection is also available at our Little Collins boutique. As it our collection continues to expand, there are always new pieces to learn more about and fall in love with. Discover more about the antique pieces available at Gerard McCabe.